3751. “Jack A Anderson,” Find-A-Grave, https://www.findagrave.com/memorial/23495098, 23495098. 3753. 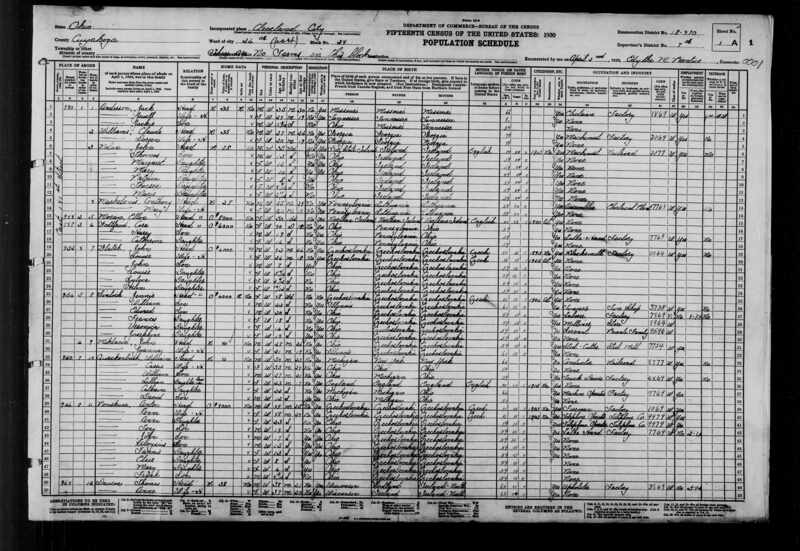 “United States Census,” 1930, OH, Cuyahoga, Cleveland, District 251, Ward 26, 1A, 7, 18-470, T626, 562, Bureau of the Census, US Dept. of Commerce, United States of America, April 2, 1930, Edythe M Prentice. 3754. “Obituaries,” Betty Ann Wolfe, The Fort Scott Tribune, Fort Scott, KS, August 13, 2011. Betty Ann Wolfe, 81, of Liberty, Mo., passed away on Thursday, Aug. 11, 2011, at the Liberty Hospital in Liberty, Mo. She was born Betty Ann Bollman on Jan. 6, 1930, in Springfield, Mo., the only child of the late Alvan L. and Mabel H. (Mitchell) Bollman. She was united in marriage to Hubert James Wolfe Jr. on April 24, 1948, in the Overland Park, Kan., Presbyterian Church. He preceded her in death on Feb. 27, 2005. After graduating high school in Odessa, Mo., Betty attended St. Luke's nursing training in Kansas City, Mo. In addition to being a full-time mom, she worked in the dental hygiene and oral maxillofacial surgery fields until her retirement. Betty is survived by her four sons and their wives, James Michael Wolfe, Liberty, Mo., Mark (Cynthia) Wolfe, Seattle, Wash., Randall (Patricia) Wolfe, Sewell, N.J., and Richard (Patti) Wolfe, St. Louis, Mo. ; six granddaughters, Karen (Michael) Williams, Olathe, Kan.; Arwen Wolfe, PCV, Sironko, Uganda, Deborah (Steven) Scheibler, Camden, N.J., Elizabeth (Neal) Page, Baltimore, Md., Christy Wolfe, St. Louis, Mo., and Becky (Jonathan) Hanna, Washington, Mo. ; and five great-grandchildren, Elaine, Thomas, Emma, Caleb and Caitlyn. In addition to her husband, she was preceded in death by her parents. Funeral services will be held 11:30 a.m., Tuesday, Aug. 16, at the United Methodist Church in Uniontown, Kan., under the direction of the Konantz-Cheney Funeral Home. The family will receive friends prior to the service beginning at 10 a.m. Private family burial will take place at a later date. Memorial contributions may be made to the Uniontown United Methodist Church and left in the care of the Konantz-Cheney Funeral Home, 15 W. Wall St., P.O. Box 309, Fort Scott, KS 66701. 3755. “Obituary,” Ray H Upchurch, The Roanoke Times, Roanoke, VA, June 21, 2000, https://familysearch.org/ark:/61903/1:1:QVY8-JZVR. 3757. Iver Gundersen, “Norway Baptisms, 1634-1927,” April 13, 1788, Bjerkreim, Rogaland, Norway, https://familysearch.org/ark:/61903/1:1:NC8N-T9C. 3758. Gunner Mikkelsen, “Norway Baptisms, 1634-1927,” September 21, 1760, Bjerkreim, Rogaland, Norway, https://familysearch.org/ark:/61903/1:1:NW5M-PMP. Maria och Johannes barn äro: Ulrica Catharina f.7/8-1839 i Brunseryd, Malmbäck död 26/5-1841 i Brunseryd, Malmbäck, Johanna f.19/6-1842 i Brunseryd, Malmbäck död 27/12-1891 i Jonsbo, Malmbäck, Anna Sofia f.17/3-1845 i Brunseryd, Malmbäck död 20/7-1845 i Brunseryd, Malmbäck, Charlotta Maria f.30/1-1850 i Brunseryd, Malmbäck död 8/6-1863 i Jonsbo, Malmbäck, Helena Sofia f.19/6-1853 i Jonsbo, Malmbäck död 27/9-1853 i Jonsbo, Malmbäck. Maria Emanuelsdotter-Holmbergs make Johannes Jönsson gifte om sig 1855, och fick i sitt 2dra äktenskap 11 barn. Helena Sofia F.19 / 6-1853 in Jonsbo, Malmbäck death 27/9 -1853 in Jonsbo, Malmbäck. Maria Emanuel Daughter-Holmbergs spouse Johannes Jonsson married in 1855, and got in his 2Pull marriage 11 children. 3762. Carl Johan Emanuelsson, “Sweden Baptisms, 1611-1920,” January 8, 1816, Malmbäck, Jönköping, Sweden, https://familysearch.org/ark:/61903/1:1:F2CW-Y62. 3763. Maria Emanuelsdotter, “Sweden Baptisms, 1611-1920,” November 29, 1817, Malmbäck, Jönköping, Sweden, https://familysearch.org/ark:/61903/1:1:F2C4-M4X. 3764. Anna Stina Emanuelsdotter, “Sweden Baptisms, 1611-1920,” June 7, 1813, Malmbäck, Jönköping, Sweden, https://familysearch.org/ark:/61903/1:1:F2CZ-77S. 3765. Emanuel Holmberg and Ulrica Andersdotter, “Sweden Marriages, 1630-1920,” June 24, 1812, Malmäck, Jönköping, Sweden, https://familysearch.org/ark:/61903/1:1:FKFX-T3D. 3766. Ulrica Cathrina Johannesdotter, “Sweden Baptisms, 1611-1920,” August 11, 1839, Malmbäck, Jönköping, Sweden, https://familysearch.org/ark:/61903/1:1:F2CH-ZTY. 3767. Emanuel Holmberg, “Sweden Burials, 1649-1920,” January 22, 1861, Malmbäck, Jönköping, Sweden, https://familysearch.org/ark:/61903/1:1:FKPG-CQ3. 3768. Ulrica Andersdotter, “Sweden Burials, 1649-1920,” January 3, 1819, Malmbäck, Jönköping, Sweden, https://familysearch.org/ark:/61903/1:1:FKPL-LX7. 3769. Klaes Johan Gustafsson and Hedda Christina Larsdr, “Sweden Marriages, 1630-1920,” March 11, 1861, Malmäck, Jönköping, Sweden, https://familysearch.org/ark:/61903/1:1:FKFX-BXV. 3770. 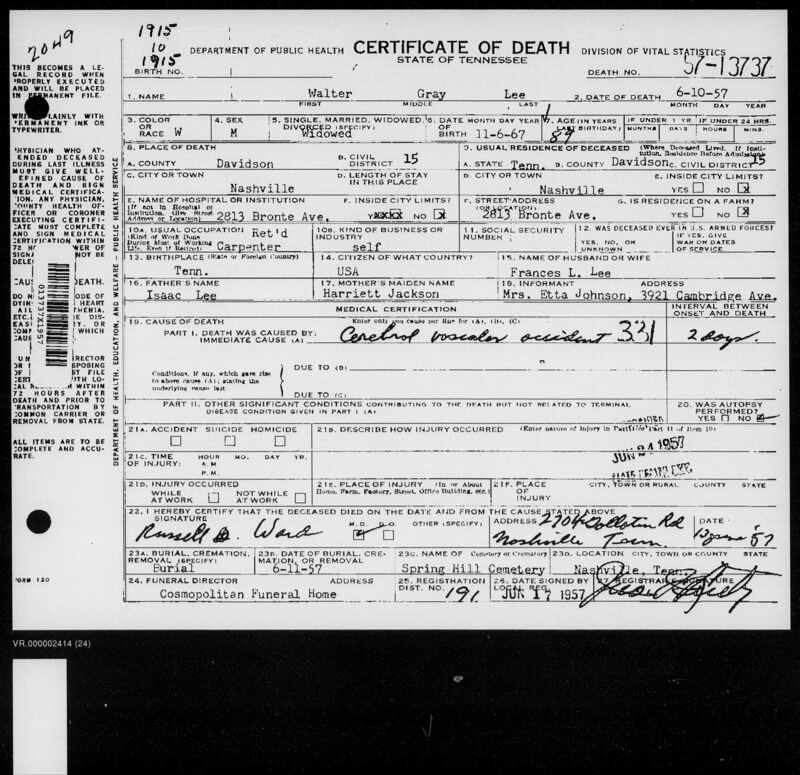 Anne Christine Munson, “Texas Deaths, 1890-1876,” January 14, 1945, Cee Vee, Cottle County, TX, https://familysearch.org/ark:/61903/1:1:K3S8-J9K. 3771. “Hedda C Gustafson,” Find-A-Grave, https://www.findagrave.com/memorial/48250440, 48250440. 3772. “Anna Christina Gustafson Monson,” Find-A-Grave, https://www.findagrave.com/memorial/48346869, 48346869. 3773. Anders Clemensson, “Sweden Burials, 1649-1920,” June 22, 1838, Malmbäck, Jönköping, Sweden, https://familysearch.org/ark:/61903/1:1:FKPL-1ZQ. 3774. Maja Stina Andersdotter, “Sweden Baptisms, 1611-1920,” May 25, 1797, Malmbäck, Jönköping, Sweden, https://familysearch.org/ark:/61903/1:1:F2CW-R94. 3775. Maria Andersdotter, “Sweden Baptisms, 1611-1920,” August 7, 1803, Malmbäck, Jönköping, Sweden, https://familysearch.org/ark:/61903/1:1:F2CC-PQ7. 3776. 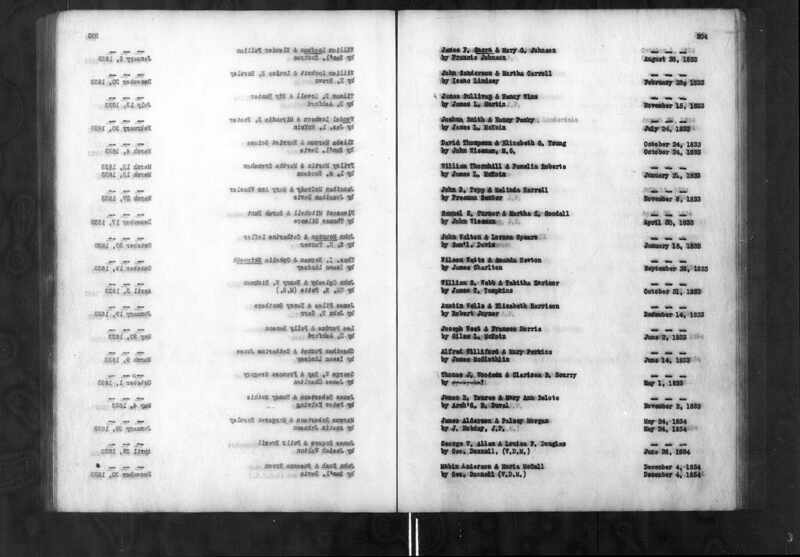 Katharina Meier, “Deutschland Heiraten, 1558-1929,” October 27, 1908, Evangelisch, Zaisenhausen, Karlsruhe, Baden, https://familysearch.org/ark:/61903/1:1:VCBN-T2B. 3777. 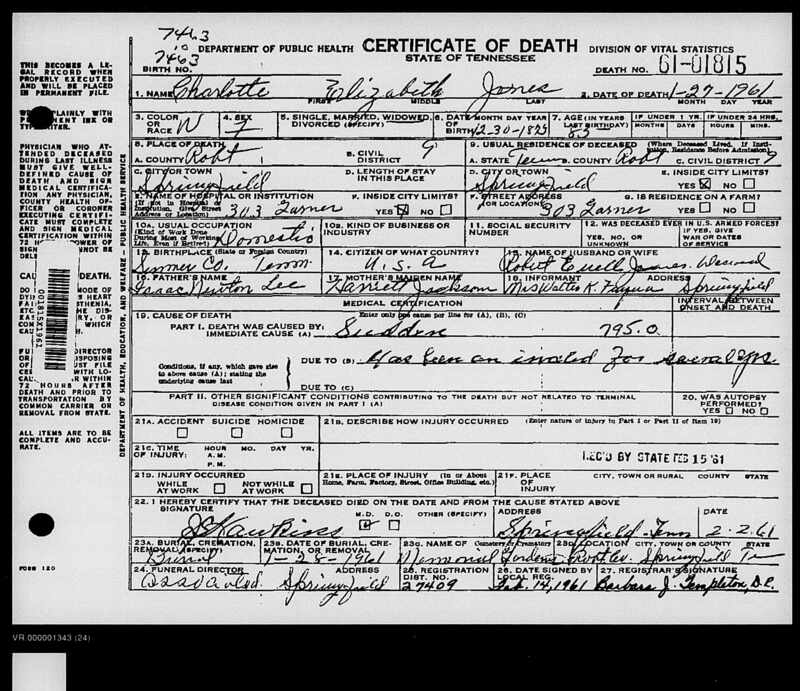 Charlotte Elizabeth Jones, “Tennessee, Death Records, 1914-1955,” January 27, 1961, Springfield, Robertson County, TN, USA, GS Film Number 001973347-Digital Folder Number 007552558-Image Number 01298, https://familysearch.org/ark:/61903/1:1:QKMS-CLVR. 3778. “Isaac Newton Lee,” Find-A-Grave, https://www.findagrave.com/memorial/41622728, 41622728. 3779. “Harriet M Jackson Lee,” Find-A-Grave, https://www.findagrave.com/memorial/41622753, 41622753. 3780. 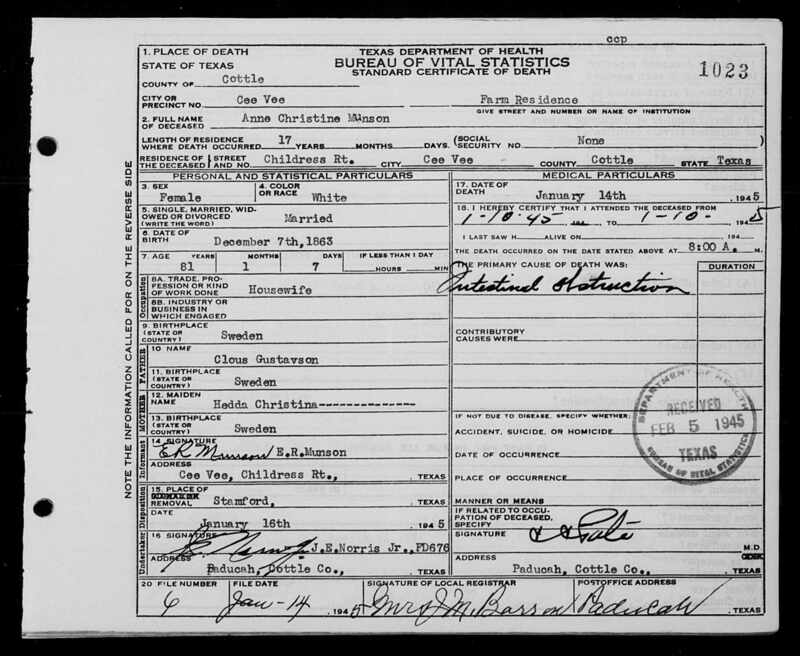 Walter Gray Lee, “Tennessee, Death Records, 1914-1955,” June 10, 1957, Nashville, Davidson County, TN, USA, GS Film Number 001973347-Digital Folder Number 007552558-Image Number 01298, https://familysearch.org/ark:/61903/1:1:QKM9-LQ3D. 3781. “William Floyd Shannon,” Find-A-Grave, https://www.findagrave.com/memorial/47158431, https://www.findagrave.com/memorial/47469982, 47158431, 47469982. 3782. “Linnie Neill Shannon,” Find-A-Grave, https://www.findagrave.com/memorial/47469981, 47469981. 3783. “James Marion Shannon,” Find-A-Grave, https://www.findagrave.com/memorial/47163911, 47163911. 3784. “Sarah Alice Baggett Shannon,” Find-A-Grave, https://www.findagrave.com/memorial/47163472, 47163472. 3785. “Archie B Baggett,” Find-A-Grave, https://www.findagrave.com/memorial/84242059, 84242059. 3786. “Louise A Webb Moss,” Find-A-Grave, https://www.findagrave.com/memorial/142380835, 142380835. 3787. “Robert Moss,” Find-A-Grave, https://www.findagrave.com/memorial/133032274, 133032274. 3788. “Willie B Moss,” Find-A-Grave, https://www.findagrave.com/memorial/142380819, 142380819. 3789. 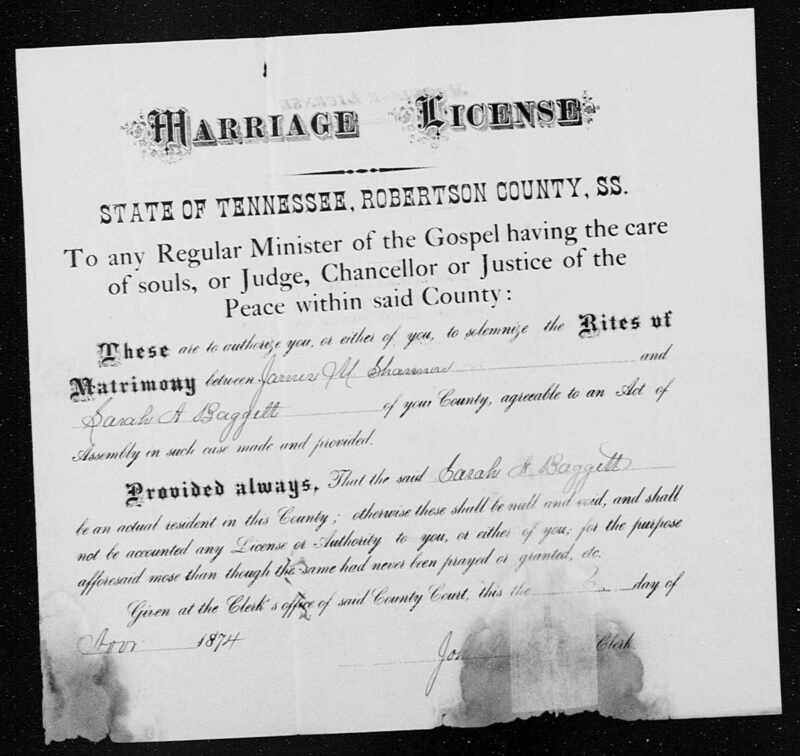 James M Shannon and Sarah A Baggett, “Tennessee, County Marriages, 1790-1950,” November 6, 1874, Robertson County, TN, https://familysearch.org/ark:/61903/1:1:QK41-YWXX. 3790. 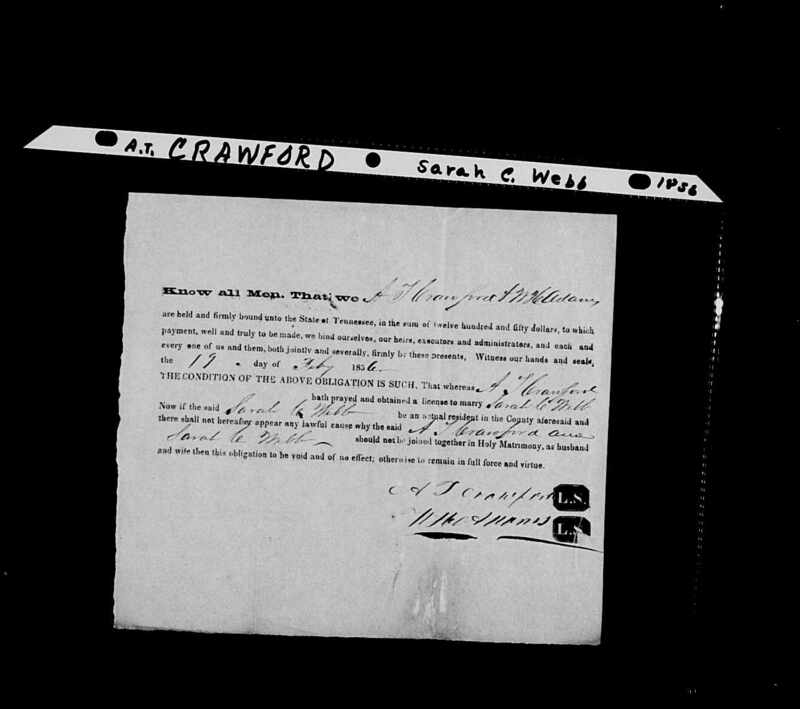 A T Crawford and Sarah C Webb, “Tennessee, County Marriages, 1790-1950,” February 19, 1856, Robertson County, TN, https://familysearch.org/ark:/61903/1:1:QK41-TJJ4. 3791. 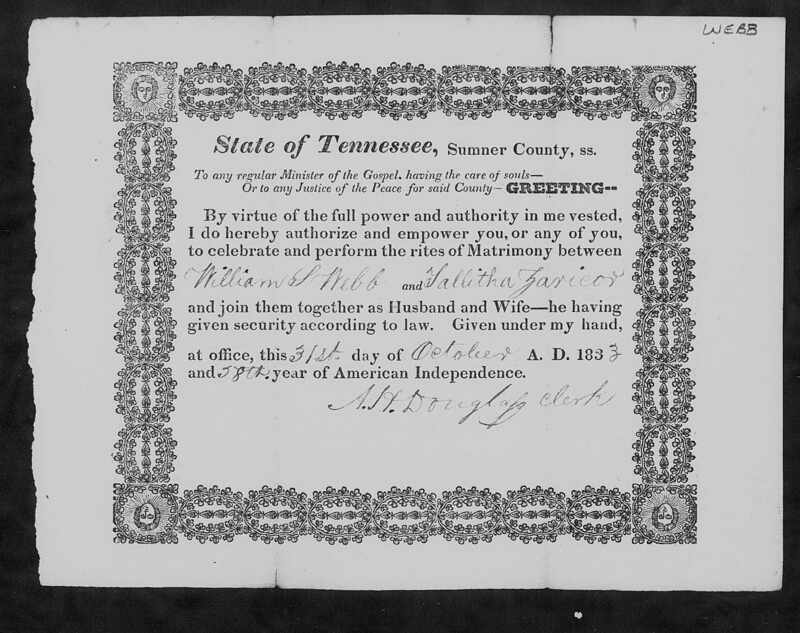 William S Webb and Tallitha Zaricor, “Tennessee, County Marriages, 1790-1950,” October 31, 1833, Sumner County, TN, https://familysearch.org/ark:/61903/1:1:QKH3-CBNB, https://familysearch.org/ark:/61903/1:1:QKH3-G2CQ. 3792. “Elizabeth Webb Starkey,” Find-A-Grave, https://www.findagrave.com/memorial/107244442, 107244442. 3793. “William Starkey,” Find-A-Grave, https://www.findagrave.com/memorial/107244394, 107244394. 3794. Lucinda Hutchenson, “Virginia, Deaths and Burials, 1853-1912,” October 9, 1893, Second District, Franklin County, VA, https://familysearch.org/ark:/61903/1:1:XRM8-VN5. 3795. “John Harold Gaver, Sr,” Find-A-Grave, https://www.findagrave.com/memorial/51481898, 51481898. 3796. “John Harold Gaver, Jr,” Find-A-Grave, https://www.findagrave.com/memorial/101879202, 101879202. 3799. “Obituaries,” Lodi News-Sentinel, Lodi, CA, January 22, 2014, http://www.legacy.com/obituaries/lcsun-news/obitua...mp;pid=169213614&;. Rita Torrigino, 62, passed away following a short illness of a stroke and heart attack on January 15, 2014. She was born Rita Jean Anderson in Avenal, California on December 29, 1951. Her parents preceded her in death and were Hallie M. Anderson of Galt, CA. and Jack A. Anderson of Golden Valley, AZ. She was one of five sisters and is the first of the five to pass. Her sisters are Jacqueline (Jacqui) Davy (Dean Davy, deceased) of Lodi, CA, Donna Label (Dr, Norman Label) of Nevada City, Robbie Zakoor of Reno, NV and Karen Michele Anderson of Galt, CA. Rita graduated from Galt High School in 1970. She attended Avenal Elementary School until the age of eleven, when the family moved Galt, CA. After that she attended Galt Elementary School. She was always known as one who loved to care for animals. It was important to her that her dogs always have a home and be well fed and loved. Rita originally met her husband, Jeff Torrigino, while attending Galt High School. Rita loved her family with all of her heart and was a loving wife and a caring mother. She was a very talented artistic individual. The art that she could create with her hands was beautiful and she was able to express herself through the art until arthritis prohibited her from doing so with her hands. She worked for her father at J & E Body and Paint Shop in Galt in her early years, after graduating. Then she worked for Don Silva, private investigator, in Old Sacramento, CA. Later she returned to Galt to work at Ambrogio Electric. She is survived by her husband, Jeffery Torrigino of Lodi, CA. Rita and Jeff Torrigino were married on February 9, 1974 in Carson City, NV. After their marriage, she and her husband lived in Galt, CA and in recent years lived in Lodi, CA. Jeff was the love of her life. Rita had three children, who were a very important and essential part of her life. She loved them unconditionally and with all of her heart. Her children were so precious to Rita. The first born child is Jack Anthony (Tony) Garrett of Lodi, CA; the second born is Jeremy Torrigino, who preceded his mother in death. Her baby was Shannon Torrigino Deel (husband Matt Deel) of Lodi, CA. Rita's grandchildren that will miss her called her "NeNe" They are: Alexandria Mae Torrigino Garner, Cierra Jean Garner, Seth James Garner, and Caitlyn "Garrett" Ory, all of Lodi, CA along with Chase Garrett of Colorado Springs, CO.
Rita is survived by the following nieces and nephews: Jennifer M Davy-Stanley (Matthew) of Lodi, CA, Alyssa A. Label of San Diego, CA, Joseph A. Label, and Jacob M. Label of Nevada City, CA and Steven J. Wayment of Galt, CA. She is also survived by the following Great Nieces and Nephews: Jessica A. Stanley, Jacqueline (Jacqui) Stanley, Mathew Stanley, all of Lodi, CA and Evangelyn Zakoor, Hallie Zakoor, Jayden Zakoor, Ashlyn Zakoor, Cohen Zakoor, and Scotlyn L. Zakoor of Reno, NV. Rita's two puppies, Sebastian and Tyson, join with all of Rita's relatives in mourning her and celebrating all of the wonderful caring things that Rita did for others. Arrangements are through Ben Salas in Galt, CA. Viewing will be from 10:00 am to 1:00 PM on Wednesday, January 22, 2014. A Memorial Service will be at 2:00 PM on Wednesday, January 22, 2014 at Ben Salas Funeral Home in Galt, CA. Final internment will be on Friday, January 24, 2014 at 2:00 PM at Galt Arno Cemetery District in Galt, CA. 3800. “Rita Jean Anderson Torrigino,” Find-A-Grave, https://www.findagrave.com/memorial/123950897, 123950897.